PRIZES: Grand Prize (1) One (1) Grand Prize is available. 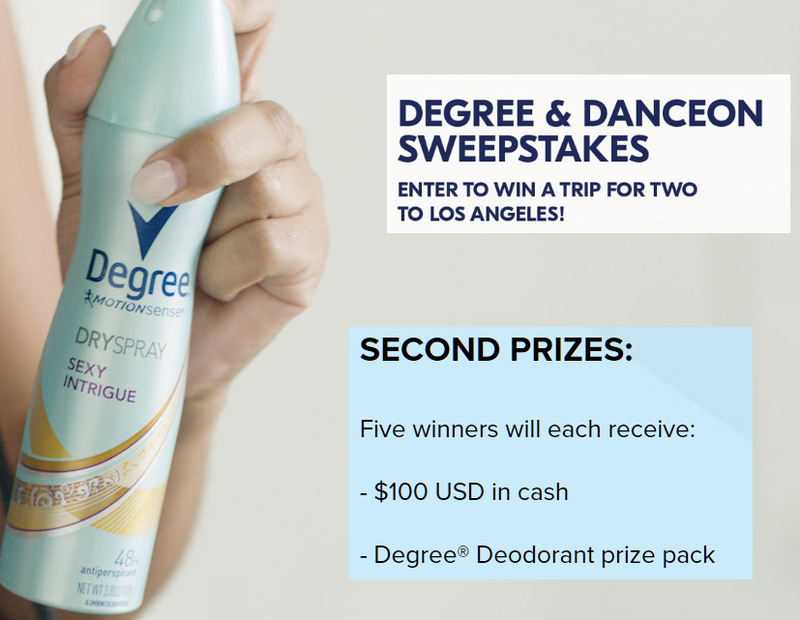 Grand Prize consists of one (1) trip for winner and one (1) guest (together, the "Attendees") Two VIP Tickets to So You Think You Can Dance Live! 2018 on December 3, 2018 at the Dolby Theatre in Los Angeles, CA. The trip includes round-trip coach airfare from a Sponsor-specified major US airport nearest the Winner's residence to Los Angeles, CA; two (2) nights standard hotel accommodations (single room, double occupancy, room and tax only) at a hotel to be selected by Sponsor; and two (2) tickets for the Attendees to the Event. Travel must be completed in December 2018 on dates specified by Sponsor or prize will be forfeited and Sponsor will have no further obligation to winner; and two (2) Sponsor-selected Degree prize pack consisting of an assortment of Degree products, for both Attendees. Approximate Retail Value ("ARV") of the Grand Prize: $3,999.00 Second Prize (5) There are five (5) Second Prizes available. Each Second Prize consists of: One Hundred Dollars ($100.00) (awarded in the form of a check) and a Sponsor-selected Degree prize pack consisting of an assortment of Degree products (ARV One Hundred Dollars $100). ARV of each Second Prize: Two Hundred Dollars ($200). Total ARV of all Second Prizes: Thousand Dollars $1000.